Nearly every construction project requires some type of concrete cutting to complete the job. While cutting of concrete seems to be straightforward and simple, there are many other things that should be considered to have a safe concrete cutting project. Safety first: you need to be mindful that the dust created by concrete wall sawing is potentially damaging to the human body, particularly to the eyes, sinuses and lungs. The dust can also be abrasive and corrosive and can create damage. Dust control has become a huge importance when it comes to cutting the concrete either with a core boring bit, saw or a drill. Two common methods used in controlling dust are pneumatic devices and wet cutting. In terms of pneumatic devices, this pulls the dust away in the air stream to minimize the amount of dust created while wet cutting collects the dust using cooling water. If you are using a diamond cutting blade like the ones by JEM Concrete, then the water will serve as lubrication and cool off the cutting tool. There are certain considerations that must be made when handling the resulting slurry. A drainage must be present or a vacuum system used to regulate the spread of cooling water. When you are using electrical powered tools, adequate grounding, appropriate ground fault or insulation, then applying the right protection is a must. Standing in a puddle of water using an electrical tool is never a good idea. 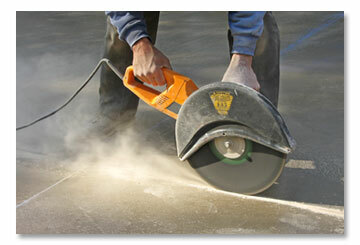 JEM Concrete has decades of experience in Indiana concrete cutting. No job is too big or too small. For a free consultation, give us a call at: (574) 288-8464.